The Fast-Draw Mercantile, Hand Held Timer when used in conjunction with the Highwayman Indoor Target System was designed to allow multiple shooters to practice Cowboy Fast-Draw indoors without noise or the smoke and odor of spent primers. This system has three major components: The Hand Held Timer, The Highwayman electronic target, and the SSA Revolver Conversion Kit. 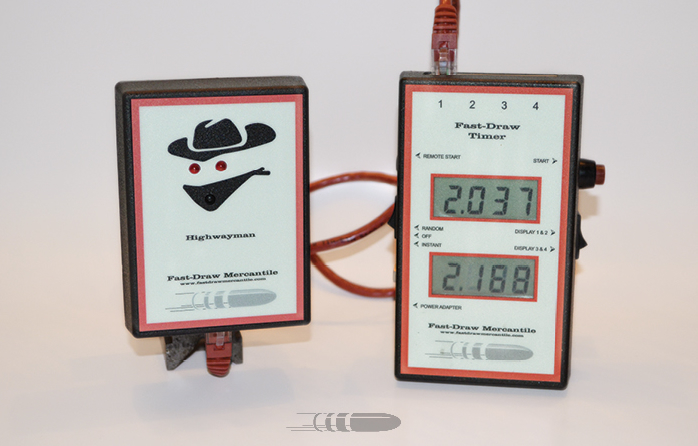 The Fast-Draw Mercantile Hand Held Timer will control from one to four, (two pair) of Highwayman electronic Targets. The timer is powered by either a 9v battery or by a plug AC adapter (supplied). The Fast-Draw Mercantile electronic target unit receives-transmits information from-to the Fast-Draw Hand Held Timer via an Ethernet cable. To order or get answers to any questions please contact us!